Oppertus is an independant European research and development team, working since 2001 in number of fields, and now concentrated on six main projects. This method is based on a specific double rack that cooperates with gears linked to the output shaft through one-way clutches. One or more of these racks are associated in order to create an infinitely variable transmission. Applications are numerous : gearboxes and clutches for cars, scooters, bicycles and ships of all sizes, electricity generation, no-crank piston engines, absorbers and suspension generating electricity, braking systems, etc. This invention is a CVT (continuous variable transmission) which, for the first time, uses gears. It also brings a very efficient feature which is that the transmission ratio varies as a function of the resistive torque. The engine rotates the planet carrier (dark blue), which makes the three "secondary planets" rotate when they are in contact with the crown sector (bright pink). These secondary planets in turn make the primary planets and the sun rotate. The movement is sent out through the aluminum shaft. A freewheel inside the "secondary planets", combined with synchronization teeth at the begining of the crown sector, guarantees that there cannot be any teeth conflict between them and the crown sector. Modifying the angle between the secondary crown sector (light blue and the crown sector carrier (yellow) changes the radius of the crown sector, which changes the transmission ratio continously from positive to negative, going through a "zero" position where the secondary shaft would have to stop if the crown sector carrier (yellow) itself could not be rotating. When the crown sector rotates, it drives an electric generator or any type of KERS. The crown sector may also be driven by an electric enging adding its power to the one of the main engine. it allows to combine two engines, for example a thermic engine and an electric one. This concept also allows a very large number of other combinations. 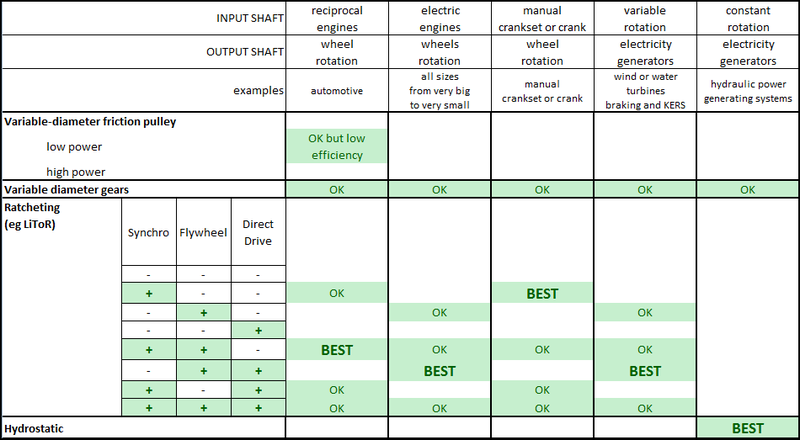 This table shows the best applications of the four main CVT techniques.. "Synchro" means the movement of the rack is synchronized with the pistons of the engine, or the crankset of a cycle, a hoist or a winch. "Flywheel" means a flywheel is inserted between the CVT and the output shaft. "Direct Drive" means a clutch enables connecting the output shaft to the input shaft directly or through a standard gearbox. Licenses SAS is a recognized innovator in printing technologies. Specialized in the field of dynamic printing it’s teams innovated strongly to create a new way of printing baptized: selective lenticular printing. Technology SAS has now finalized the development of an impossible to forge signature, the answer to the major security need felt by consumers and businesses, across new services. All Oppertus technologies are protected by multi-national patents pending or delivered in number of countries.